JJC LH-37EPII Metal Lens hood is designed to fit the three lenses: Panasonic Lumix G Vario 12-32mm f/3.5-5.6 ASPH. Lens, Olympus M.Zuiko Digital ED 14-42mm f/3.5-5.6 EZ Lens as well as Olympus M.Zuiko Digital 17mm f/2.8 Lens. The hood adopts a screw-on design. The front of the hood provides an extra 58mm filter thread. This hood will provide you many benefits: it shades the lens from stray light, improving your contrast and image quality; in inclement weather, it can assist in keeping moisture or wind-blown debris off the lens; and it protects the front barrel from the inevitable impacts against walls, door frames, and other real-life obstacles. 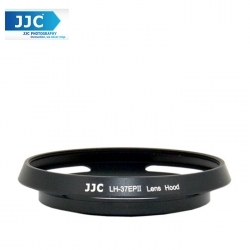 JJC LH-37EPII will not cause vignetting.